One of the items on my study abroad bucket list was to deepen my understanding of the UK political system by getting involved with a campaign or political group here. This started to look like a possibility when, a week and a half ago, I ran into someone from the Liberal Democrats student group on campus – he was selling chocolate cake (obviously, this signaled that they’re good people) to help defray the costs of a trip to Parliament they were taking. 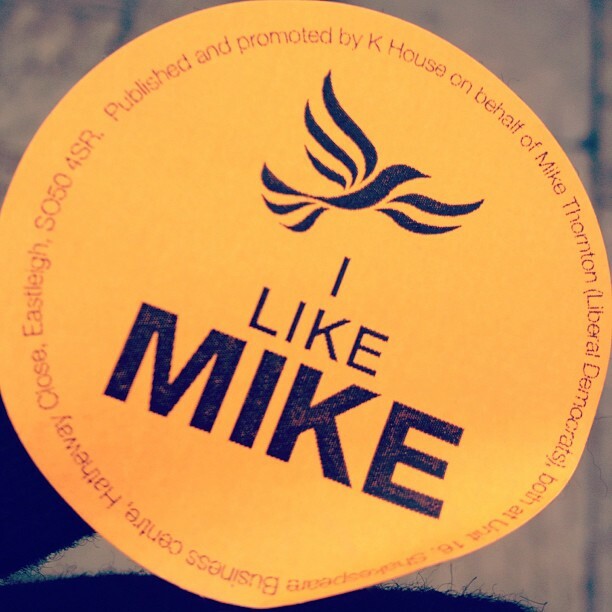 I bought some (extremely tasty) cake, got myself invited on the Parliament trip (which was incredible), went to a couple of meetings at a local pub, and now I’ve spent a day campaigning for the Liberal Democrat candidate in the contentious Eastleigh by-election. In case you’re starting to worry: No, I’m not planning on doing a bunch of political blogging here. I have plenty of other platforms for my word vomit about politics. But the experience of participating in a campaign in a foreign country was definitely interesting. The weirdest thing about the whole day was how eerily similar it was to the congressional campaign I interned for last fall. The setup was almost exactly like our GOTV weekend operation – it was even unbearably cold, just like November! The walk sheets we used for canvassing were almost identical. The office even smelled the same (I’m totally not kidding). Apparently, this isn’t all coincidental – I guess a lot of Lib Dems went to the States during our elections and were trained by Democratic leaders. Still, it was pretty strange to be in a totally different country with a very different political system and feel like I was back in the old office. Truth be told, the similarities in campaign experiences stuck out to me more than the differences. But there were some notable differences. Like, this election isn’t necessarily just a two-horse race. The Lib Dems and the Tories are the ones to watch, but Labour, UKIP, and something called the Monster Raving Loony Party are battling it out as well. Sure, the occasional congressional race gets a random third party candidate, and of course no New Yorker can forget the bizarre slate of 2010 gubernatorial candidates, with the Rent Is Too Damn High Party represented, but you never seem to see loads of Americans seriously supporting anyone other than Democrats or Republicans. Here, I saw four parties pretty widely represented – and one house with several Monster Raving Loony Party posters in the window. Though I’m still thawing from being out in the freezing cold all day and I won’t even get to vote for the candidate I was volunteering for, I’m glad I had the chance to make it to Eastleigh and get involved. Mike Thornton seems like a genuine and dedicated guy. And I definitely understand the UK political system a bit better. I’d call the day a win-win.